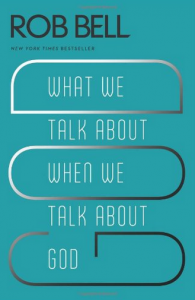 Rob Bell’s newest book is out, though without the hype that accompanied his last book. We gave a full article to reviewing Love Wins when it came out in early 2012, we gave an article to Brian McLaren’s A New Kind of Christianity, and we gave another article to the theological method (narrative theology) that drove much of what Bell and McLaren were doing in those books. Also, we gave a short review to another of Bell’s important books that was written in 2005, Velvet Elvis.This much attention is given because these authors have a huge influence and what they have said has become quite popular in many circles. Bell’s newest book explores what he thinks we ought to believe or think about God. He starts by saying we should be open to new understandings of God because we live in a new and challenging world (this is classic Enlightenment liberalism). More importantly says Bell, we must recognize that language “both helps us and fails in our attempts to understand and describe the paradoxical nature of the God who is beyond words” (17) (remember his narrative theology and epistemology). This leads Bell to say that God is with us (in an intuitive and mysterious sense), for us (think Love Wins), and ahead of us (think Jurgen Moltmann’s Theology of Hope). And so, Bell says we must recognize those moments when God is trying to help us forward in the evolutionary process toward the place where he is. This is done through that intuitional acceptance of all of life as given by God to take us forward and bring us all together, despite the overwhelming mysteries. I was not as surprised by the theology of this book considering the previous ones. Though, a few things were added to the paradigm of how I understand Bell. Here is the paradigm: explicit references to the theology of Paul Tillich (God is the ground of our being, pp. 15, 216); reiteration of narrative epistemology (failure of language and verbal revelation); and acceptance of a quasi-panentheistic god born out of Moltmann’s theology (Bell also praises Teilhard de Chardin, pp. 218, 220). What does all that mean? Bell has an amazing ability to write and communicate major theological trends that carry the modern and postmodern day and put them into words that the person who cannot read Tillich, Moltmann, Teilhard, Frei, and Lindbeck will get and hold in a practical way. Unfortunately, he denies the Bible is verbally inspired and communicates propositional revelation. So then he denies the God described in the Bible (and in the creeds of the early church). And, he accepts a view of universalism that has an understanding of sin and salvation that is patently un-Christian. He may be a New York Times bestselling author, but his ideas cannot be considered Christian in any meaningful sense of the term.